The first time Eleth practiced magic and brought down disaster, like accidentally disrobing a whole town, the people had laughed about it for days. Once they got over their sense of modesty, that is. Accidentally bringing a drought upon them was not as funny, judging from the glares and occasional muttered insults people threw at her as she passed. Turns out dying crops and the imminent threat of starvation was no laughing matter. “Why’d you do it?” the blacksmith asked as she slinked past, head drooping and shoulders hunched. Immediately the cloud that floated over her head at the mention of her ban on using magic appeared, earning a wistful sigh from rain-starved observers. “NO!” everyone around her shouted, from the baker’s wife to Sern. Even Sern’s dog howled at her words. Eleth turned away. That was it, then. The town was doomed. A blush stained her cheeks. She couldn’t very well tell Weimm, who was even being considered for an apprenticeship with the King’s Head Mage, that she’d tried imbuing a faulty love spell with her own magic. A spell meant for him. How was she to know the old crone in the distant cottage with the missing teeth and whispered rumors of dark magic wasn’t precisely authentic? Eleth’s mother used to threaten her with the old crone when she wouldn’t behave. 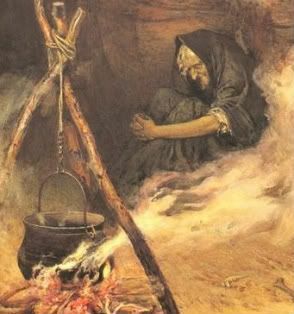 The old crone made it easy when she wore dilapidated robes that always smelled of garlic and sported a giant wart that was whispered to be fake. The seamstress told everyone at the pub she saw it fall off once and the old crone press it back on. Genuine wart or not, she’d seemed capable of helping Eleth. She could still remember the old crone’s instructions. Maybe it wouldn’t have gone so horribly wrong if she’d kissed his mouth instead of his chin. But then, who knew pretending to be drunk to stagger into his lips wouldn’t really work? Or that it would earn her the reputation of being the town drunk? Well, one of the town’s drunks. She was startled out of her reverie by a polite cough from Weimm. “I mean, I was trying to make the rain fall sooner so we’d have more plentiful crops?” Her words fell into the pitch of a question at the end. He was close enough that she could see the gray flecks in his blue eyes. He reeled back, stunned. Eleth found she couldn’t breathe anymore. Would suffocation be less unpleasant than slow starvation? “Why would you do that?” His voice was soft. His shoulders were shaking. She’d made him cry? Instant remorse squeezed her stomach. In response he pressed his lips against hers. She melted against him, almost missing the cool rain that touched her heated cheeks. They broke the kiss, staring up at the sky in shock as rain poured down on them. In the distance, Eleth would swear she heard the cackle of an old crone. Sandra V. Dias started writing when she was a little girl and learned how to spell her name, though she hopes her writing has improved since then. She lives in Texas with her ridiculously adorable giant lab. When she's not writing, she reads obsessively, plays with her dog, works, draws, daydreams, and dances. I'm in love with stories, whether it's in books or movies, so writing immerses me in a story in which I can control what happens. If my characters behave and don't take the story elsewhere, that is. Writing is my own personal entertainment system, and actually better than a big screen TV! Sandra! This story is so cute! I loved it. You have such great dialog... especially when Eleth was confused or struck speechless. I'm still smiling from reading this. Wonderful. I loved it. It appears effortless - but I bet it wasn't! I'm impressed with the wittiness in your story! All of the little one line jokes made me smile throughout. I especially liked, "Well, one of the town's drunks..."
I'm still squealing! Oh! Loved that!